Letter of condolence to Mrs. Messer on the death of her husband, written by Charles R. Andrews, a New Hampshire native who had made his way to Kansas by the 1870s. Mr. Andrews was born in 1846, the son of Reuben and Lydia [Bailey - possibly maiden name or previous marriage name] Andrews of Wilmot, New Hampshire. I have no information on a further identification of Mr. Messer. 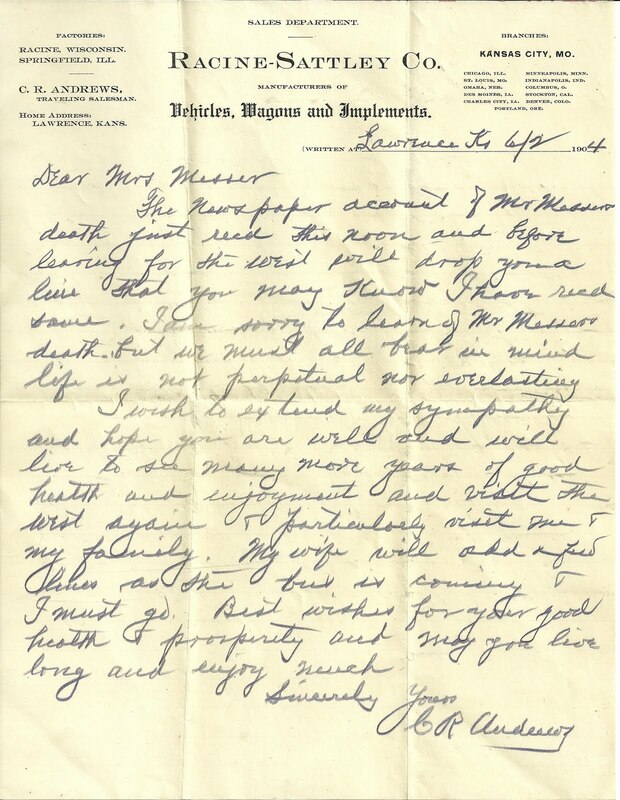 The letter implies that Mrs. Messer sent Mr. Andrews the newspaper account of her husband's death, but I may be misinterpreting. See for yourself in the transcription below. From Mr. Andrews' words, it appears that Mr. Messer was of an advanced age. Mr. Andrews' expressed hope that Mrs. Messer will visit the "West" again makes me wonder if the Messers were acquaintances from New Hampshire or from Indiana, where Mr. Andrews' wife Margaret was born in 1853, especially since it's implied that Mrs. Andrews also knows the Messers. On the other hand, Mr. Andrews was, according to the letterhead, a traveling salesman for the Racine-Sattley Company and must have made acquaintances all over the Midwest, including states farther east than Kansas. The fact that his wife seemed to know the Messers might have resulted from Mr. Andrews' work. The Racine-Sattley Co. was a manufacturer of vehicles, wagons and implements, with plants in Racine, Wisconsin and Springfield, Illinois. The company had branches in Kansas City, Missouri; Chicago, Illinois; St. Louis, Missouri; Omaha, Nebraska; Des Moines, Iowa; Charles City, Iowa; Minneapolis, Minnesota; Indianapolis, Indiana; Columbus, Ohio; Stockton, California; Denver, Colorado; Portland, Oregon. When Mr. Andrews speaks of "leaving for the West", he may have been referring to one of the branch offices in Colorado, California or Oregon. The letter mentions that Mrs. Andrews will be writing a few lines, but her lines are not on the reverse of this sheet. She apparently wrote her own letter, which may not have survived, or at least was not kept with her husband's. The newspaper account of Mr. Messer's death just recd. this noon and before leaving for the West will drop you a line that you may know I have recd. same. I am sorry to learn of Mr. Messer's death but we must all bear in mind life is not perpetual nor everlasting. I wish to extend my sympathy and hope you are well and will live to see many more years of good health and enjoyment and visit the West again and particularly visit me and my family. My wife will add a few lines as the bus is coming and I must go. Best wishes for your good health and prosperity and may you live long and enjoy much. If you have any insights into the identification of Mr. Messer or Mr. Andrews and his family, please contact me. Thanks for stopping by!